This review first appeared in the May 29, 1992 issue of the North County Times. 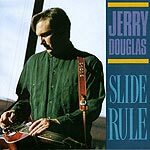 After a series of weird New Age/jazz albums for MCA in the mid-'80s, country super-sideman (he's a regular in the TNN house band and has backed practically everyone in country) Jerry Douglas has returned to his roots for his latest solo effort. One of the best dobro players around, Douglas does all right as a producer, too, as he asked fellow stars Stuart Duncan (fiddle), Mark Schatz (bass) and Alison Krauss (vocals) to sit in on a jamming session of bluegrass. Krauss joins him for a beautiful cover of "I Don't Believe You've Met My Baby" and the band does a top-notch country version of Billy Roberts' "Hey Joe" (made famous by Jimi Hendrix), but it's the breakdowns that work best: "Shoulder to Shoulder" and Bill Monroe's "Shenandoah Breakdown."